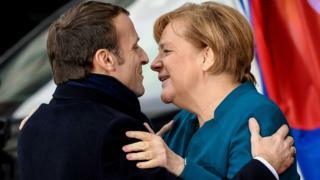 France and Germany have signed a new treaty on Tuesday aimed at breathing new life into their place at the centre of the European Union. German Chancellor Angela Merkel highlighted peace and security and backed the emergence of a European army. French President Emmanuel Macron said the challenge was for Europe to become “a shield” against the tumults of the world. France and Germany agree to establish common positions and issue joint statements on major EU issues – formalising their existing co-operation. They also plan to act as a joint force at the United Nations. What did the two leaders say? German Chancellor Angela Merkel said the treaty came amid “special times” with the rise of populism and nationalism. “For the first time, a country is leaving the European Union – in the form of Great Britain,” she added. Those who forget the value of peace and spread lies are accomplices in the crimes of the past,” Mr Macron said. “I would rather look our Europe in the face and strengthen it to protect our peoples. That is what we are doing,” he added. “We are committed to developing a common military culture, a common defence industry and a common line on arms exports,” Mrs Merkel said. The idea is not new – both leaders have called for a common European defence force that would operate within – and not replace – Nato. Nato’s Secretary General, Jens Stoltenberg, gave the treaty his approval, saying Nato had been briefed on the military matters. “For decades, Franco-German cooperation has been essential for security and stability in Europe,” he said, adding that the treaty was a reminder “of how far Europe has come since the devastation of the Second World War”. European Council president Donald Tusk – a native of Poland – sounded a note of caution in a speech he gave at the ceremony. “Germany and France can, and should, serve the whole of Europe well,” he said. Central and Eastern European states have refused to accept German and French leadership on migration. The allegation spread quickly on social media, despite several debunking pieces in the mainstream news media. Behind the beautiful old stone edifice of Aachen’s historic town hall, two allies warmly pledged to deepen their relationship. But outside, in the bitter cold, Eurosceptic protestors and yellow vest demonstrators shouted at EU supporters. The treaty – critics argue – is short on substance and risks alienating other EU member states. And as Mrs Merkel and Emmanuel Macron emerged to greet the crowd outside, their smiles looked a little weak. Aachen is about ambition, vision and symbolism. But Mrs Merkel’s power is waning and Mr Macron is struggling at home. Sceptics wonder what will become of their promises once their time in office is done.